Sochi has modern port with attractive Cruise Terminal. The port is accessible for ships up to 200 meters in length and 8 meters draught. For ships that anchor, the tender ride takes about 10 minutes. Getting into Russia is easy if you are on a cruise or organized group. If you go ashore with an organized shore excursion, or a licensed guide, you need only carry your passport. It does not have to be an excursion sponsored by the ship, but you will need to get the paperwork in advance via email from any local guide you use for touring. However, if you want to do independent touring, you will need a Visa. Getting your Russian Visa isn't difficult, but can take several weeks of pre-cruise planning. If you know that you want to tour on your own, check with your travel agent or cruise line to arrange for a Visa. This cannot be done after you sail! Sheltered by these mountains, this Black Sea city has been a popular Russian resort area for nearly two centuries. Its most outstanding characteristics are a favorable climate, beautiful landscapes, beaches, parks, health spas and mineral springs. Enjoy a stroll along the seafront promenade and admire the lovely Botanic Gardens, the pretty Riviera Park with its statues and pools, and the palatial Matsesta Spa, renowned for its healing waters as well as Stalin's dacha. Head into the countryside and visit a local tea plantation and be treated to some traditional Russian song and dance while you sip tea and eat homemade pie! Since it hardly pays to organize your own visa. Doing a organized excursion will be the only way to see this part of Russia. For those seeking adventure, there is cave exploring, white water river rafting, canoeing, parasailing and jet skiing. Other activities include sailing, horseback riding, hiking and sightseeing trips to one of the areas many waterfalls or to the watchtower on the Akhun Mountain for stunning views of the Caucasian mountain peaks. The Agura waterfalls are one of the most picturesque places to visit in the vicinity of Sochi. Following the narrow path leading along the picturesque Agura Ravine, you can see the waterfalls formed by a fast flowing river. The magnificent Eagle's Rocks and the crystal-clear waterfalls, attract thousands of tourists every year. 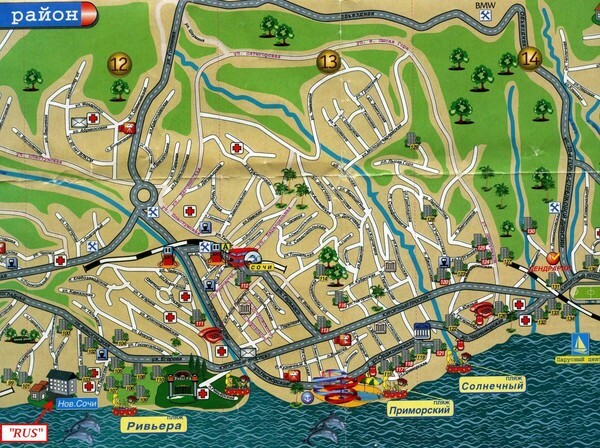 From here you can see the panorama of the city and the Black Sea below you. In 1901, the Russian peasant Iuda Koshman brought several tea plant seeds from Chakva to Sochi, and sowed them in Solokh-Aul. His plantation became the foundation for the northernmost tea in the world, now called the Dagomys Tea Plantation. A short tour of the plantation leads to a charming old Russian Teahouse, where you will find an excellent example of famous Russian hospitality. You can enjoy tea, cakes, hazelnuts and local honey served in a traditional way, accompanied by a spectacular folk performance. You can even participate in the most fascinating part of the show, an old-fashioned matchmaking ceremony. Look for Russian recordings, local crafts and artwork, traditional nested matryoshka dolls and woven wool scarves. The terminal also hosts cafe “Pelican” and a duty free shop.